While many feel the music industry is in disarray right now it’s always a breath of fresh air to hear a new and exciting band that’s not afraid to let it all hang out and take chances with their music. With their latest musical offering: New York area Eight Feet Deep, it’s clear to me they have surpassed what I could consider the a-typical musical release from a band in 2013. From the beginning notes of Track 1: “Overdose Thrill” to Track 3 ‘”Time for a Change” this band BLEW ME AWAY. Eight Feet Deep is in itself a progressive musical anthem and delivers 3 mind blowing tracks that will keep you mesmerized with mysterious messages, and music that is adrenalized. It also possesses a vibe that is unmistakably 70’s retro. Eight Feet Deep combines many impressive musical styles like vintage Hard Rock, retro Rock of the 70’s and even Progressive Fusion- Rock to traditional Soul Rock. Now that’s a pretty whacked out yet impressive list. A few tracks even expand the possibilities of a radio hit in the making. What’s more: the musicianship of the band: Billy ‘Pills’ Fridrich-lead/rhythm guitars, bass, songwriter. Featuring: Ed Terry-vox; Bobby Rondinelli-drums; Dan Miranda-bass will blow you away. The music of Eight Feet Deep will also remind you of O.A.R, Dispatch, Tim Reynolds, and Iron Butterfly. The production value is also top notch and the vocal front of Ed Terry goes beyond traditional pigeonholing by any music critic. Ed Terry delivers a gifted vocal ability as he glides with precision through all pieces with amazing harmonies and a captivating vocal timber. 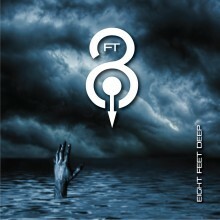 Eight Feet Deep goes beyond just good playing and world class progressive songwriting. Lyrics are also an important factor for me when listening to a band or artist. In this aspect I found them quite impressive as well as they paint you an impressive visual between the spoken word and mind numbing messages. Eight Feet Deep personify the wild Life Experience. The band 2 piece line up. I would say the band possesses above average to advanced Hard Rock, Progressive Rock playing abilities. Timing is spot on within the genera. Fridrich can hold his own on the guitar & other aspects of the production with tones & rhythms that remind me allot of Van Halen’s second release. Singer DiMeo just makes the whole thing work bringing allot of mojo to the table. H These 2 musical weapons can be a force to be reckoned with. Vocals from DiMeo work within the confines of this music.He’s got a solid rock R&B Edge to his vocals. The musicpossesses a heavy metal to hard rock stigma. All in all great workout music. Definitely high adrenalin rock with a late eighties, early nineties flair. will remind you of classic Firehouse, Candlebox, Cinderella, Van Halen, & White Lion. All in all great music to work out or party to. The songs Simply put – hard rock boogie grooves with a side of R&B. All pieces are progressive & dynamic delivering aggressive guitar attack against solid low end punch. The vibe Overall very upbeat, with lots of wisdom. Has it’s shares of happy & sad moments. The production Not the most polished sounding production I’ve ever come across, however Eight Feet Deep manage to make their point via this 4 song collection.Overall this EP has it’s moments. The good Honorable mentions go out to the above average playing & Singing abilitiesfrom both members. Honorable mentions go out to the vocal presence of DiMeo & the musical foundation laid for him by Billy ‘Pills’ Fridrich. I think it’s obvious who the brainchild of the musical project is. Folks out there who enjoy Hard Rock with a early nineties flair will fall head over heals with this CD. The bad Not the most polished sounding production I’ve ever come across. But perhaps that is what Eight Feet Deep was aiming for with this late 80’s vibe. We’ve seen artists like Lenny Kravitz & Al Green do this, why not Eight Feet Deep? CD sounds like it’s stuck in the 80’s with a Hair Metal vibe that just isn’t as popular as it used to be. There are powerful bands out there nowadays who have made the successful transition. The ugly Eight Feet Deep should consider doing the same & modernizing their sound a bit for the next CD. The verdict From beginning to end Eight Feet Deep will not only keep you on the edge of you seat, but will melt your face off in the process The Bottom Line If you need high octane music to work out to – look no further. Eight Feet Deep hails from New York. Members are: Billy ‘Pills’ Fridrich – lead and rhythm guitars, bass, drum programming; Mike DiMeo – vocals. Some may remember Billy ‘Pills’ Fridrich as the lead guitarist & songwriter for previous bands Celestial & HeavySurf. His side project, No Excuses, regularly plays throughout the NY city area covering the best of 90’s rock. His latest project Eight Feet Deep combines both rock & funk with respect to the overall writing & playing styles. For Eight Feet Deep, Billy plays lead, rhythm and bass guitars, writes and programs the drum tracks, and composes the lyrics. Logging in at just over 17 minutes the EP quickly takes to flight with rocking intro piece “Leader”. This song dishes out driving rock rhythms against distorted guitar riffs & sizzling solo work. Singer DiMeo makes a solid first impression laying down a solid rock-blues vocal groove. Track 2 “Throw Down” dishes out more of a modern rock vibe with dynamic musical flow & ebb, coupled with hooky harmonies & impressive vocal accents from DiMeo. My favorite track: track 3 “No Regrets’ serves up full tilt rock ditty reminiscent of old school Van Halen with well placed harmonies & an impressive vocal finale from DiMeo. As the CD unfolds I can hear many musical influences reminiscent of classic late eighties & early nineties rock with musical textures reminiscent of Candlebox, Van Halen, White Lion, Firehouse, & even Soundgarden. The musicianship is pretty solid across the board as this band dishes out solid shops along the way. DiMeo’s voice works well across the board as he lays down infectious vocal lines is in the vein of Chris Cornell (Soundgarden), Vince Neil (Motley Crue), Mike Tramp (White Lion) & even Ronnie James Dio. I might add DiMeo takes some impressive vocal risks along the way indicating to me a strong & confident vocal ability. His voice goes down smooth yet has a jagged edge to it. All harmonies are extremely creative & well executed. Equally as impressive is the guitar virtuoso of Billy ‘Pills’ Fridrich with guitar chops that are hot to the touch & solos that will be sure to make your head spin. The EP ends with “My Friend” a perfect finalle statement that really brings home the EP with a perfect balance between classic & modern hard rock, with just a dash of funk just like the bio had indicated. Pro Mixers these days make their money keeping attention spans for more than 10 seconds at a time. It is true that modern music has taken 10 steps backwards on musicianship in recent years, but as a result 20 steps forward with the mixing craft. Why am I bringing this up? It is fitting that this EP was mixed with a style compatible with that era. This production has an aftertaste of a late 80’s and early 90’s mix job very much like the music itself. For the record this is an Industry standard production, but it’s fair to say due to its somewhat dated sound, marketability is it’s biggest weakness. “Eight Feet Deep” is a rock solid EP from start to finish. Its strong suit – the guitar showmanship, strong melodic delivery & overall consistency of the catalogue. This CD will be a joy for guitar enthusiasts out there who enjoy technically savvy guitar showmanship, & shredding solos via a classic 80’s rock delivery. Equally as impressive is the vocal presence of Mike DiMeo. He has an infectious vocal presence full of warmth & passion. It’s fair to say this EP was released 20 years too late. If this was 1982 this band would have a serious chance a putting a gold records on the wall. Unfortunately it’s 2010 & although the music scene has changed dramatically over the last 2 years, 10 years, 20 years, there are still good bands out there like Eight Feet Deep who refuse to be forgotten. Eight Feet Deep also deserves credit for successfully merging hard rock with a modern rock-funkadelic feel. So if you’re looking for a full tilt musical experience that will remind you of the hair band glory days then I highly recommend you get Eight Feet Deep with this EP. I look forward to hearing the full length real soon. Today I listened to the latest CD from New York musical 2-some Eight Feet Deep (Eight Feet Deep – 2010) Venturing to their website I get the impression both Mike DiMeo & Billy ‘Pills’ Fridrich take their songwriting craft pretty seriously. From start to finish this latest CD from 8FD delivers the goods & is very entertaining in nature. It has a very strong rock, heavy metal quality to it, & even dabbles in old hair metal of the late 80s. Any fans of any of these musical styles will enjoy this latest release from 8FD. Its clearly marketed for those who like the musical mystique of say a Van Halen, White Lion & Winger. I get the impression * Feet Deep is rolling with what they knows as performers & songwriters. Favorite tracks include Track 1 (Leader) & Track 3 (No Regrets) The CD has an amazing feel to it & is very melodic. Within each one of these compositions DiMeo & Fridrich finds their musical mojo & just ut it out there. The playing is spot on & just makes the whole CD more entertaining. The overall vibe is full tilt. In the mid 80’s Richie Blackmore and Ian Gillian departed from the band Deep Purple to branch out on their own. That left the band in need of a singer and guitar player. They hired Tommy Bolin ex.James Gang guitarist and brought in newcomer David Coverdale who went on to fame as lead singer of Whitesnake to handle the vocals. The band released an album called Come Taste the Band to mixed but mostly positive reviews. The album was a good one but it wasn’t anything like the classic Deep Purple material we had listened to in the past. The reason I said all of this was because this EP from Eight Feet Deep make me think. What would have happened if keyboard player Jon Lord left the band and rather then replace him the band went without any keyboards. What would that Deep Purple album sound like? My quess would be that it would sound pretty close to this CD. Billy ‘Pills’ Fridrich sounds like a croos between Richie Blackmore and Johnny Winter on the guitar while singer Mike DiMeo has a bit of that Ian Gillian luster in his vocals. © 2019 Eight Feet Deep – The Band. All Rights Reserved.